High performance as compared to conventional Centrifugal and Mini Monoset Pumps. Self priming upto 8.0 metres at mean sea level. No jamming-Centrifugal Impeller with adequate clearance. 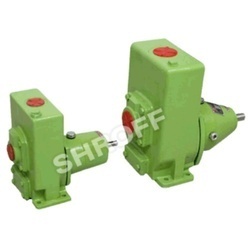 Pumps in the LKHSP series are self priming, which means they can be used to pump products containing air or gas. This makes them ideal as return pumps in CIP (cleaning-in place) systems, as well as for emptying tanks. Pumps feature a tank, a non-return valve (normally closed) on the inlet side, a tee and a non-return valve (normally open) on the bypass line. Supported by a group of capable employees, our firm is involved in providing Self Priming Centrifugal Pump. 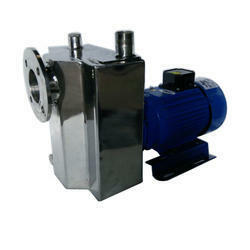 We are engaged in providing a vast quality array of Self Priming Centrifugal Pumps to our valuable clients. These products are fabricated by using premium quality of raw material under the supervision of our skilled professionals. We are devoted towards manufacturing the qualitative range of Self Priming Centrifugal Pump. Delivery size upto 200 mm. Capacity up to 600 m3/hr, head upto 180 mtr. Temp. upto 2000 C.
Leveraging over the skills of our qualified team of professionals, we are instrumental in offering wide range of Self Priming Centrifugal Pump. We are engaged in providing a vast quality array of Griswold Self Priming Centrifugal Pumps to our valuable clients. These products are fabricated by using premium quality of raw material under the supervision of our skilled professionals.